Three-dimensional printing technology is lending its design capacity to nylon bikes that are both durable and lightweight. Photo via EADS. Want a bicycle as strong as steel but half as heavy? Print it out using 3D laser printing technology. Two British engineers designed the revolutionary Airbike, the first two-wheeler made entirely of nylon through a process known as additive layer manufacturing (ALM), also known as 3D printing. The laser-based technology allows for the creation of three-dimensional objects by laying down successive, thin layers of material, including metal (such as titanium, stainless steel or aluminum), nylon or carbon-reinforced plastics, until a solid object emerges. 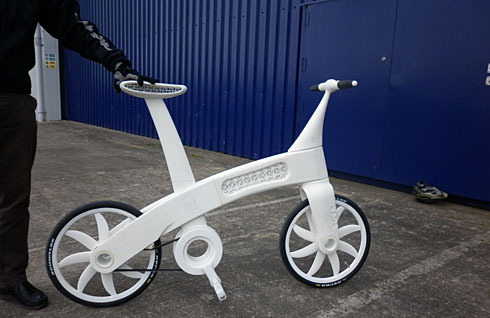 In the case of the Airbike, the vehicle was essentially “grown” from fine nylon powder, allowing the body of the bike to be built in one piece, while incorporating the wheels, bearing and axels during the process. The method is fast and efficient, using about one-tenth of the material required in traditional manufacturing, thereby reducing waste. What’s more, the complex computer-aided designs do not cost any extra to produce. “ALM is truly game-changing technology that has the potential to revolutionize manufacturing for the 21st century,” said Dr. Jean Botti, the chief technical officer at the European Aeronautic Defence and Space Company (EADS), the company behind the technology. The potential use of the technology in aircraft production has already inspired the design and name of the Airbike. The eight-bladed wheels of the bicycle imitate the design of the scimitar propeller of the Airbus A400M, Gizmag reports. We’re excited to see bicycles as the first prototypes for this technology. Reducing the need for motorized vehicles in a cost-efficient, non-polluting and aesthetically pleasing way can help clear the air, stem global warming, make streets safer and get people moving again. It could save our cities.